If you’re unfamiliar with the Cartoon Network series, The Brave and the Bold’s comedic overtones will hit you over the head like a hammer. 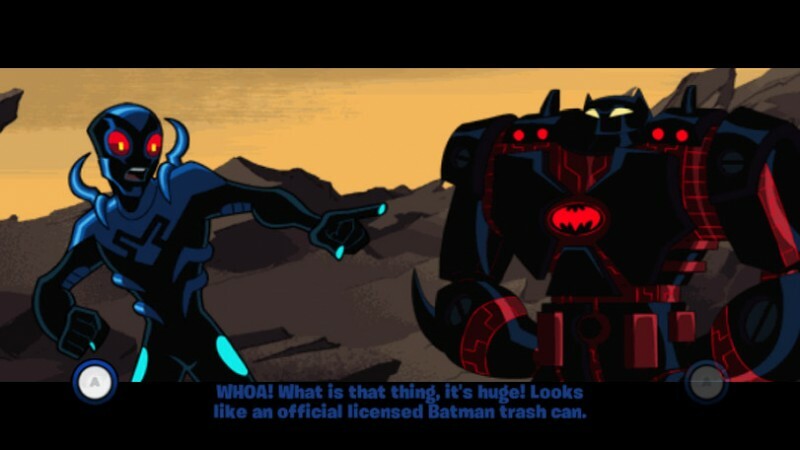 This is especially true if your only frame of reference is Paul Dini’s grim masterpiece Batman: The Animated Series. 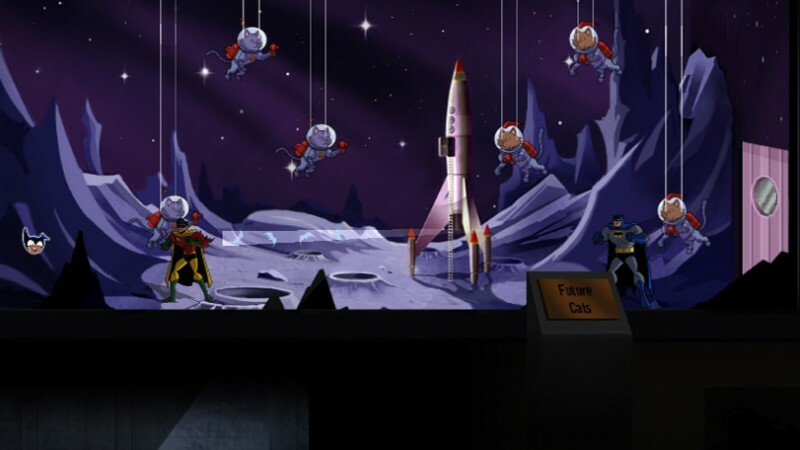 Both the cartoon and game take a lighthearted approach to crime fighting more in tune with Adam West’s live-action show from the ‘60s. Cheesy one-liners are thrown as often as punches, but they elicited genuine laughs on my end. Listening to Batman and Robin’s thinly veiled jabs is a treat, as is the absurd opportunity to see Commissioner Gordon in cat form. The Brave and the Bold breaks down into four episodes. 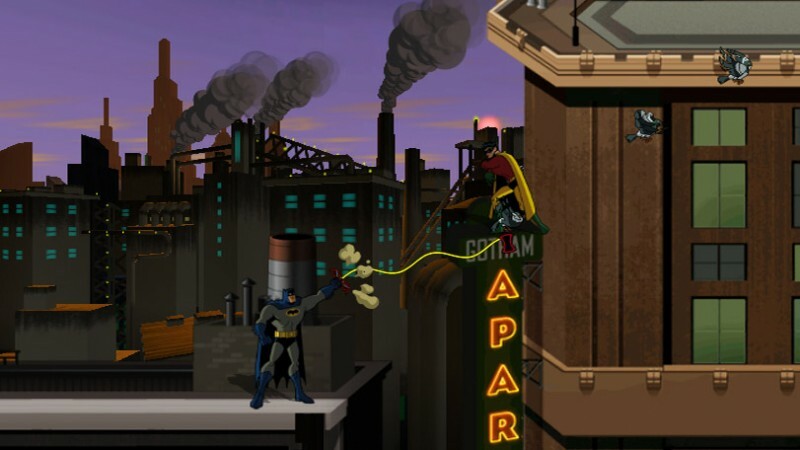 Every segment starts with Batman and his respective partner in a bind – a new character for each episode – only to escape moments before the opening credits roll. All four episodes follow an arc of mystery, discovery, confrontation, and ultimately the defeat of an iconic DC villain. Diverse and lengthy, the episodes balance a cast of lesser-known characters with DC’s more recognizable faces. For every Catman there is a Catwoman, for every Gentleman Ghost a Hawkman. 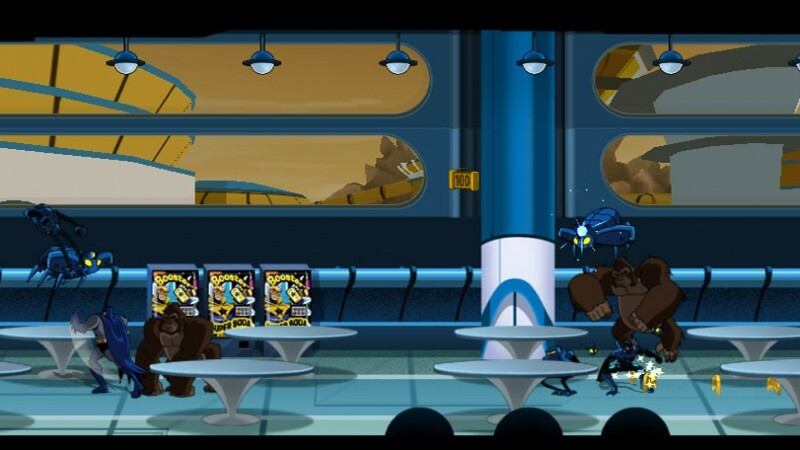 The Brave and the Bold is a side-scrolling classic brawler with tight controls and an expansive library of moves. Light and heavy attacks are augmented with grapples and throws, a variety of aerial moves, special attacks, and the ability to call in support characters for powerful room-clearing combos. Wii motion controls are used sparingly, which I appreciate. Heavy attacks are initiated by shaking the Wii remote, and special attacks with a Wii remote/nunchuck shake combo. A ground pound attack also uses a quick flick of the controller, but that’s it. No incessant flailing. The best way to play Brave and the Bold is with a friend. While single-player offers the same basic experience, the support character isn’t particularly helpful. Expect to do the heavy lifting. The AI isn’t fantastic outside of combat, either. At one point Hawkman attempted to follow me through a treacherous path of platforms above molten lava, only to fall to a fiery demise over and over again. I sat there and watched until the amusement wore off. Each character has unique melee attacks, special abilities, and upgradeable tools. This multifaceted approach allows players to tailor combat to their liking. You could focus primarily on hand-to-hand combat, or opt to upgrade your gadgets instead. I often used my triple Batarang to push back groups of foes before initiating a flurry of attacks. Explosives are also effective, particularly if you herd groups of enemies into one area before detonating the blast. Most items also have practical applications that can help solve the simple environmental puzzles. Your fighting performance earns you money to purchase new abilities and upgrades. You receive more cash for maintaining hit combos and destroying environmental objects. Conversely, you can also empty your purse by dying repeatedly. The game keeps track of individual scores during co-op, but the pot is curiously shared at the end of each chapter. Player one gets to decide where all the joint money is allocated, which is a strange way to handle the finances. Making Batman your primary focus for upgrades is a smart move since he’s involved in every mission, but making sure your co-op pal stays engaged is important, too. You won’t unlock Batman’s complete library of tools until the end of the game, encouraging players to return to finished chapters and explore previously unreachable areas. Tight controls and cheeky humor make Brave and the Bold an easy recommendation for bat and brawler fans alike. Accessible and entertaining, it’s also a perfect fit for family play. thrown as often as punches, but they elicited genuine laughs.